It is back to school time once again. Here is a list of 10 helpful apps that will make your trip back to school easier and more rewarding. We all know how important sleep is to our everyday life and students are no different. Getting the right amount of sleep is crucial to being successful in school. The Sleep Cycle tracks your sleep patterns and wakes you up during your period of lightest sleep so that you wake up feeling naturally rested. Sleep Cycle uses your phone’s accelerometer to identify sleep phases by tracking your movement in bed. Sleep Cycle will wake you up during the lightest sleep phase during a predetermined 30-minute window. The app is 1.69 for Android users and .99 for the iPhone. All students need access to a scanner in today’s digital age. 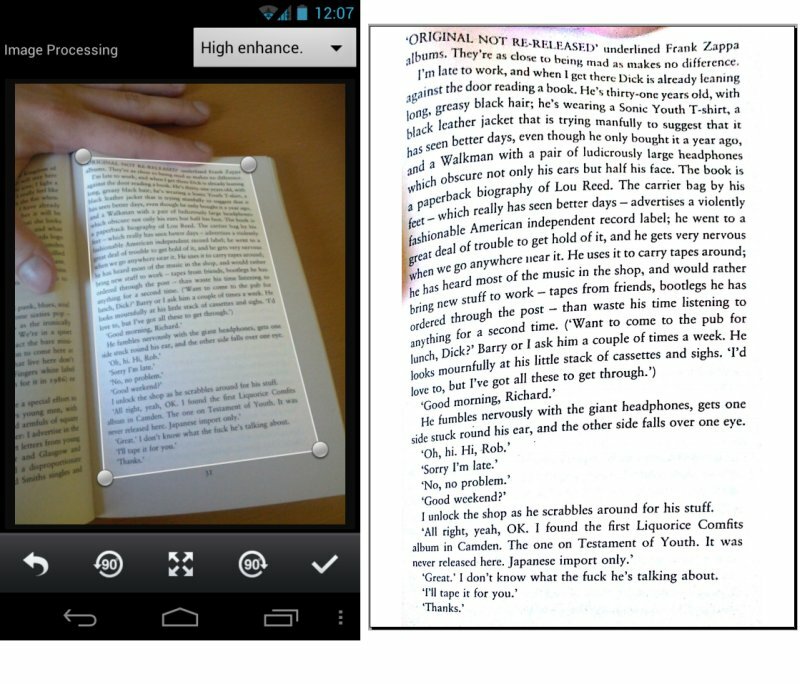 This app makes scanning documents as easy as taking pictures. You can use the app to take pictures of documents that you wish to turn into a .PDF and save them on your device for emailing and printing purposes. This is very helpful for creating digital versions of handwritten notes, and even sending sources and documents to friends and colleagues. The basic account is free for both Android and iPhone users which provides the user with 200 MB of cloud storage space. The premium account is 4.99 a month or 49.99 a year and gives you more options and 10 GB of storage space in the cloud. Learning a new language can be difficult for some students. Duolingo is a great fee app that helps students learn a new language in a fun and interactive way. You can learn Spanish, French, German, Italian, Portuguese, Dutch, Irish, Danish, Sweedish, and English. Duolingo won 2013 and 2014 Google Play Editor’s Choice and Best of the Best. TIME magazine declared that “Doulingo may hold the secret to the future of education.” 34 hours of Duolingo are equivalent to a semester of university-level education. This is a great study companion or good for the student who is traveling abroad. Doulingo is available for Android and iPhone users. Using a flash drive can be troublesome for some students because they forget it and leave it behind or lose it. Dropbox Mobile is a useful app for students to save and store their important documents so they can access them on their mobile device as well as on a computer. Dropbox Mobile allows you to use the popular cloud storage system on your mobile device. With a free account, users get 2GB of storage. Dropbox Mobile is available for Android and iPhone users. EasyBib is available for Android and iPhone users. Staying organized is an intricate part of being a successful student. My Study Life is an app that allows students to give up their paper planners to store their classes, homework assignments, exam information all in the cloud making the information available on any device. My Study Life allows students to track their homework assignments, store exams, manage classes, and even gives you notifications and reminders of unfinished tasks and upcoming events. My Study Life is free for Android and iPhone users. Evernote is available for Android and iPhone users. Khan Acadamy is a great free resource for all students at every level of education. It allows students to access to educational videos and learning exercises that are Common Core aligned. It provides instant feedback and offers step by step hints for all problems. The app allows students to show their work by writing down thoughts as they solve problems with an expansive scratchpad. Students can track their learning across devices because the app syncs between devices and khanacademy.com. Students using this app have access to learning videos, interactive exercises, and in-depth articles in math (arithmetic, pre-algebra, algebra, geometry, trigonometry, statistics, calculus, linear algebra), science (biology, chemistry, physics), economics, and even the humanities with playlists on art history, civics, finance, and more. Khan Acadamy is available for Android and iPhone users. Edmodo is a great resource that allows teachers and students to engage and collaborate for free anywhere anytime. Edmondo was awarded the 2013 EdTech Digest Award for Best Product, it makes the idea of a paperless classroom a reality. Edmondo allows students and teachers the ability to have classroom discussions, post assignments, track their grades, share files and links all within the online social platform. Edmondo serves as a virtual classroom and could be a great way for students, teachers and parents to stay connected and remain on the same page. Considering that most students spend a great deal of time on social media networks like Facebook and Twitter this app allows teachers the opportunity to create a social network that is individually geared toward their student’s education. Edmodo is available for Android and iPhone users. Wolfram Alpha has been comaired to the Star Treck computer and allows its users the ablity to access a unbelieveable wealth of information across a great deal of domains. Woldfram Alpha uses its vast collection algorithms and data to compute answers and generate reports for you. Wolfram Alpha holds over 10 trillion pieces of data and 50,000 equations and can be sued to generate reports on topics ranging from trigonometry and astronomy to genealogy and mythology. It gives students graphs, step by step explanations and formula detals. This app gives students a wealth of information at their fingertips and the ablity to become a know it all on many different topics depending on their interests and studies. Top 20 Productivity Apps to Keep You (and Your Boss) Organized [INFOGRAPHIC] The Jury Is Still Out on Amazon’s Recently Released Cloud App 13 Reasons Why Using WordPress is Beneficial For Your Website What is “The Internet of Things?” [INFOGRAPHIC] How does Google know what you search for on the Internet? This is very helpful for creating digital versions of handwritten notes, and even sending sources and documents to friends and colleagues.